Who was James Jesse Strang? Over the years, scholars and sensationalizers have wrestled with this question. Three answers are given below, from two typical online encyclopedias, from Terry Pepper, and from Warren Post. James Jesse Strang was born in New York State in 1813, where he became a member of the Baptist church at the age of twelve, and began study of the law at the age of twenty-one. Marrying his wife Mary, they moved with their three children to Chautauqua County New York, where he worked as a lawyer, Baptist Minister and the County Postmaster. With the loss of his Postmaster position in 1843, he moved his wife and three children to Wisconsin, and the following year again moved to Nauvoo Illinois. While in Nauvoo, Strang met and established a relationship with Joseph Smith, the founder of the fledgling Mormon Church, which was at the time headquartered in Nauvoo. 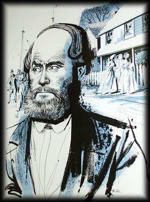 Impressed by Smiths rhetoric and ideals, Strang converted to the Mormon faith. Doubtless, Strang's admiration for Smith must have been mutual, since Strang was baptized within three months, and soon became appointed as an elder of the Church. Not long thereafter, Smith was jailed for destroying the office of a newspaper that had written criticizing articles about he and his Church. While in jail, Smith was assassinated, thereby leaving the Mormon Church without leadership. As elders in the Church, both Brigham Young and Strang claimed to have been chosen by Smith to succeed him, and a power struggle ensued between the two, as they clamored for Church supremacy. The Mormon followers quickly chose sides as either "Brighamites" of "Strangites." Strang even produced a document that he claimed was written by Smith some time before his death, stating that Strang was to be Smith's successor. While the document may have swayed a few fence-sitters into the "Strangite" camp, it was not sufficient to the beliefs of the majority. Thus, Young won the struggle and assumed leadership of the Church. Young immediately excommunicated Strang, and soon thereafter led his followers to Utah. Strang and his group of dissident followers went to Voree Wisconsin (later to become known as Spring Prairie.) Strang took leadership of his new Church to heart, and quickly tightened his grip over his followers, decrying material possessions, forbidding the eating of meat, and tightly holding the sexual morality of his followers to the highest standards. As had Joseph Smith before him, Strang claimed to be blessed by heavenly visions, and claimed that an angel had appeared before him, revealing the location of an account of an ancient people, buried in a hill south of White River bridge. After publicly revealing this vision to his followers on September 13, 1845, four of his most trusted elders accompanied him to a location beneath an oak tree deep in the woods, at which point Strang informed them that it was the spot beneath which the secret was buried. The four men later reported that "the tree was surrounded by a sward of deeply rooted grass, such as is usually found in the openings, and upon the most critical examination we could not discover any indication that it had ever been cut through or disturbed." Proceeding to dig, eventually discovering an earthenware case, the witnesses further reported "We examined as we dug all the way with the utmost care. We say, with utmost confidence that no part of the earth through which we dug exhibited any sign or indication that it had been moved or disturbed at any time previous. The roots of the tree stuck down on every side very closely, extending below the case, and closely interwoven with roots from other trees. None of them had been broken or cut away. No clay is found in the country like that of which the case is made." Opening the clay case, it was found to contain six mysterious brass plates, which were taken as being of divine origin. 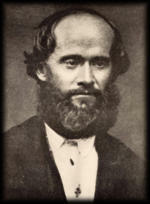 This revelation sealed Strang's status as a "Prophet and a Seer of God" in the eyes of his followers, and their zealous dedication to their leader increased immeasurably. When the influx of gentile (non-Mormon) settlers into the Voree area threatened to disrupt their lifestyle, Strang set-out to identify a safe refuge for his flock. Arriving in Northern Michigan, Strang began to search in the Charlevoix area, eventually identifying Beaver Island with it's secluded harbor, lush forests and abundant fishing as "where I will come to build up my kingdom." And so it came to be that in June 1848, a steamer carrying Strang and approximately twenty-five of his followers landed on Beaver Island. Before winter ice closed "St. James Harbor" for the season, approximately one hundred more of his followers arrived. In deference to Brigham Young, Strang had frequently spoken-out against the practice of polygamy. However, unbeknown to most of the public, he secretly took Elvira Field as his second wife in 1849. Field had been traveling with him disguised as a man, and had been passing herself off under the name of Charles Douglas. On July 8, 1850 Strang proclaimed himself to be "King of the Kingdom of God on Earth," before two hundred and thirty five of his followers. While claiming to be King only of his followers, he began extracting tithes from the gentiles, consisting largely of fishermen who called the island home long before the Strangites arrival. Refusing to pay, it was rumored that Strang had many of the fishermen taken into the woods and flogged, in the hope of opening-up their purse strings. Strang then ordered the County Treasurer to hand-over one tenth of the taxes collected on the island, a move that once again met with a wholly negative reception by the island's "gentile" population. Strang erected a large log temple, owned a commercial boat and saw mill, which was used to saw lumber for housing for the island's growing Mormon population. Strang then founded a newspaper "The Northern Islander," and published books and pamphlets defending his right of Divine rule. Friction continued to increase between gentile and Mormon, fueled by Strang's suffocation of the whiskey trade in the area, and his sudden open embracing of polygamy as a "Divine requirement" of his followers. Many scuffles broke-out between the two factions, leading to the "War of Whiskey Point," won by Strang's followers when they fired a cannon into an unruly gang of rebels assembled at the trading post. As a result of such altercations, by the early 1850's most of the gentile population on Beaver Island abandoned their homes for new lives on the mainland. Mandating a requirement that all Church elders take at least two wives, Strang did his religious duty by marrying his third wife in 1852, and his fourth and fifth in 1855. All-told, Strang fathered twelve children from these five women. In spite of the divine imperative, no more than twenty of the islands Mormon men were known to have actually practiced polygamy. Strang's control of his disciples began to widen beyond matters spiritual. Many consider his edict that women begin wearing bloomers, as opposed to the customary long skirts of the time, to have been a major component in the resentment that led to his eventual downfall. By 1851 Strang and his entourage managed to hold all the political offices on nearby Mackinac Island, to which Beaver Island and its neighboring islands were attached for judicial and elective purposes. However, the continuing unrest between the gentiles and Mormons on the island, combined with Strang's unconventional religious practices was not going unnoticed. The Michigan "Mormon trouble" eventually reached President Millard Fillmore himself. Fillmore instructed the Attorney General to issue orders to the U.S. district attorney of Michigan to begin prosecution of Strang for offenses punishable in the federal court. Some of the Federal charges being delaying the mail, cutting timber from pubic lands, tax irregularities and counterfeiting. The US Naval gunboat MICHIGAN was immediately dispatched to Beaver Island. Onboard, a US Marshall, Deputies and the District Attorney with highest level orders to deliver Strang and his followers to stand trial the Federal Court in Detroit. Though some subterfuge, almost one hundred of Strang's followers were lured to the ship, arriving in Detroit in May of 1851. The trial was set for the next month, and a deal was struck to allow the release of all defendants on bail. The Deputy Clerk of the Court was instructed to travel to Beaver Island to depose all witnesses. The trial ran from June 20th through July 10th. Strang drawing on his past experience served as his own defense attorney. It would appear that he did an admirable job, as against all expectation he won the case, and in victory he led his followers back to his Beaver Island Kingdom. The astounding court victory further sealed his power-base, and Strang was elected to the State legislature. In 1856, David Brown reportedly found his wife in bed with his business partner, Thomas Bedford. A group of Mormon men seized Bedford and administered immediate justice through the administration of seventy-nine lashes across Bedford's back. As a result of his treatment, a strong resentment grew within Bedford for Strang and his teachings. It would appear that Bedford was not the only member of the community to have misgivings concerning Strang's leadership, as Bedford and a group of 40 other men ambushed Strang on June 16, 1856, mortally wounding the King. The wounded Strang, along with most of his followers, set sail for Voree two days later, where Strang passed away a month later on July 8 - King's Day. On Strang's death, most of the Irish fishermen who had lived on Beaver Island prior to Strang's arrival, returned home. In fact, they found the island an improved place, since under Strang's "rule," significant improvements in cultivation, roads and housing had been made, transforming a large area of the island from wilderness to a civilized outpost. Beaver Island is still largely populated by the descendents of those original Irish fishermen. There have been persistent rumors that Strang's followers sequestered a stash of gold in Fox Lake as they were making their hasty escape from the island. Throughout the years, many treasure seekers have attempted to find the "Strang's treasure." None have succeeded. While it is likely that no treasure exists, It could also be that it just has not been found! To this day, a small and widespread group of believers follow Strang's teachings, believing that Strang was the true chosen successor to Smith. So what do Joseph Smith and the Mormon Church have to do with the Adirondack region? A man named James Jesse Strang - his parents were born in Saratoga and Washington counties at the end of the 18th century. He was born in 1811 and later moved with his wife to Chautauqua County. He later moved to Nauvoo, Illinois where he met Joseph Smith, the Prophet of the Mormon Church. Long story short, Strang converted to Mormonism, was elected to the State Legislature, claimed to have had heavenly visions, and that an angel appeared before him to tell him the secret location of - you guessed it - another buried account of ancient people, this time etched into brass plates. After Joseph Smith was killed by a mob in Illinois in 1844 a feud erupted between Strang and Brigham Young over who was his rightful heir. Smith's followers divided between "Brighamites" and "Strangites." Although Strang produced a letter from Smith appointing him the new Prophet (still in the Yale University Library), and 12,000 believers allegedly joined him, the winner was Brigham Young who excommunicated Strang and took his followers to Utah - home of the Big Love! Strang moved with about 125 followers to Beaver Island, Michigan where he proclaimed himself "King of the Kingdom of God on Earth" and well, generally pissed off the local Irish fishermen and farmers by extracting tithes from them. That didn't last long and James Jesse Strang was shot 150 years ago this June and died a short time later. His spiritual descendents are still spread around the Midwest, Canada, and even Mexico although a mob burned the Beaver Island temple around the time of Strang's death. There are no temples for the Church of Jesus Christ of Latter Day Saints (known as the True Faith - not to be confused with the Utah folks who use Latter-Day, rather than Latter Day). James Jesse Strang: 1813–56, American Mormon leader, b. Cayuga co., N.Y. A lawyer and teacher, he migrated in 1843 to Wisconsin, was converted to Mormonism, and at the death of Joseph Smith (1844) claimed the succession, saying that he had had a vision in which God had proclaimed him prophet. Excommunicated, Strang organized a colony in Walworth co., Wis., calling it Voree. Many Mormons unwilling to accept the leadership of Brigham Young were attracted to Strang’s colony. Aware of the difficulty of founding his ideal community in a Gentile neighborhood, he sought a more suitable site. In 1847 he selected Beaver Island in Lake Michigan, then sparsely peopled by trappers and fishermen. There he established a colony, driving out other settlers and setting up a despotic rule. The inhabitants of the mainland were violently opposed to the Strangite colony, and public opinion finally forced the federal government to bring numerous charges against Strang, but he successfully defended himself. His power increased; in 1850 he was crowned King James, and he was later elected to the Michigan house of representatives. His harsh rule had made him bitter enemies, however, and in 1856 he was assassinated. The colony was soon dispersed and the land and property seized by inhabitants of the mainland. Clement Strang, the father of James, was born at Stillwater, Saratoga Co., N.Y., on the 22nd of Sept., A.D. 1788. And his wife, Abigail James, was born in Washington Co., N.Y., December the 27th, A.D. 1793. David Strang, their firstborn, was born June the 9th, A.D. 1811. James Jesse Strang was born March the 21st, A.D. 1813. Myraette Strang was born April the 24th, A.D. 1818. The parents of the prophet joined the Baptist Church in early life, and remain in good standing in that church until this day. They are classed among the honorable of the earth, and being exceedingly zealous in the traditions of their fathers, have not sought after any other faith, but remain steadfast in their first faith, and have reared their children in that faith. Perhaps there never were parents more careful in training their children in the paths of virtue, than they were. The mother of the Prophet was very tender of him, in consequence of his delicate health in his youth, and equally watchful over his conduct. She would even require him to render an account of all his actions, and words, while absent from her. And he supposed it his duty to relate all his actions unto his mother, and keep nothing back. His father also was about as strict in his way and taught his children honesty and truth, and industry. At the early age of 12 years, James embraced the Baptist faith, and according to their phraseology gave bright evidence of his acceptance with God. This child grew up in favor with God and man. His mind was continually grasping after knowledge, and his faculties were such that he made more rapid advances than any of his fellows. He studied the common branches of an English education, and soon became such a master of Geography, in particular, that one might fancy that he had traversed the length and breadth of the earth. His knowledge of universal history was almost unlimited. He had an ardent desire to become well versed in civil law, and his parents granted his desires. As soon as he begun for himself, he commenced the practice of law, and was admitted to the bar, in Chautauqua Co., N.Y. and other places where he resided. He continued in his profession, and maintained the religion of his youth, until the A.D. 1844. Since that time the Church Records will show all the important acts of his life. His parents are well satisfied that he was a good man, and honest in all that he said and did. Fear God and be strengthened and obey him, for great is the work which he hath required at thy hand. Go on in hope and strength, and falter not, and he will sustain thee, and thou shalt triumph, for the voice of the Lord by the mouth of Joseph will he fulfill. And the Angel of the Lord stretched forth his hand unto him and touched his head, and put oil upon him and said, Grace is poured upon thy lips, and God blesseth thee with the greatness of the Everlasting Priesthood. He putteth might and glory and majesty upon thee, and in meekness and truth and righteousness will he prosper thee. Thou shalt save his people from their enemies when there is no arm to deliver, and shalt bring salvation when destruction walketh in the house of thy God. Thou hast loved righteousness and hated iniquity; therefore thy God hath anointed thee with oil and set thee above all thy fellows. Thy words shall be like sharp arrows in the heart of the wicked. Thou shalt rebuke those who pervert the word of thy God. Thou shalt preach righteousness and the sublime mysteries in the ears of many people, and shall bring the gospel to many who have not known it and to the nations afar off. Thou shalt drive backward and put to shame those that do evil, and the workers of iniquity shall fall. They shall be cast down and shall not be able to rise. With purity will the Lord thy God arm thee, and purity and truth shalt thou teach. Keep the law of the Lord thy God in thy heart, and none of thy steps shall slide. With thee is the fountain of truth. In thy light shall the people of thy God see, for thou shalt speak his word unto them, and from thy lips shall they receive it. The blessing of their God shalt thou put upon them, and his curse upon evil doers, if, after being oft rebuked, they repent not; and before my people shalt thou go to lead them into my ways, for unto thee has the Lord thy God given salvation. In righteousness shalt thou rule. Thou shalt redeem the poor and the needy from suffering and violence, and to thee God giveth judgment for them. Thou shalt deliver the prey from the spoiler, for God, thy God, hath put them in thy hand. And in weakness will he make thee strong. Thou shalt rule among his people. Thou shalt break in pieces the rod of the oppressor and the yoke of the unjust ruler. They shall flee away, but the way of peace shall they not find. While the day of the wicked abideth, shalt thou prepare a refuge for the oppressed and for the poor and needy. Unto thee shall they come, and their brethren who are scattered shall come with them, and the destruction of the ungodly shall quickly follow, for it already worketh. Go thy way and be strong. A number of revelations from God were given through James Strang. He also had visions and translated ancient records. Of particular importance is the Book of the Law of the Lord. James Strang was shot by assassins on June 16, 1856, on Beaver Island, Lake Michigan. 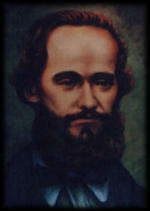 He died from his wounds on July 9, 1856, at Voree, Wisconsin. Although the assassins were former Church members with a grudge, they were apparently armed and assisted in this attack by the United States government. Their escape was certainly provided by the USS Michigan and its officers. For more information about this see Murderous Assault and Record of the Apostles, Part 2. On the seventh of July he said the active part of his life was at an end, that the bearing off of the Kingdom must devolve upon others; he felt that his ministry as chief was done. He did not say who was to be the leader of his people, but on this day his eyes brightened, and his countenance was lit up, and it was observed by all that he was a great deal better. On the eighth he began to run down, and it seemed as though he just wilted away. I asked him if he was going to leave us. He said he was. I then asked him if we were to have a successor appointed through him. A tear started in his eye, and he said, "I do not want to talk about it." Brother Hickey and Adeline were with me that night to assist me. I took the care of him till two o'clock, when Brother Hickey and Adeline got up and I finished a letter I was writing. I helped turn and fix him comfortable about break of day, and lay down for a nap. I lay about one hour and a half at the foot of his bed. When I awoke there was no one in the room but him and myself. I immediately arose and discovered that he was dying. I nursed him very attentively for about an hour, and saw no hope of recovery, when I sent for some of the neighbors. I asked if there was anything he wished to communicate. He replied, "Yes," which was the last word he spoke. All these circumstances go to confirm me in the opinion that there is a head somewhere, and that he will come in the Lord's own due time to the faithful. I proceed now to answer some of your questions which you deem of minor importance, but the big ones I shall not attempt at this time. "How many of the Saints were present at his death?" Brothers George Miller, L. D. Hickey, E. Chidester; Sisters Betsey, Phoebe, Sarah Hickey; Betsey's children. "How many attended his funeral?" Bro. Miller and family, Hickey and family, Tubbs' family, C. Linnell, Sr. Townsend and family, B. J. Wright and E. Chidester, of the Saints, and a respectable congregation of Gentiles. Bro. Hickey opened the meeting by prayer, and such a prayer I never heard except from the Prophet himself, it seemed as though the earth trembled, the wagon where he stood did at any rate, he had the Spirit to such a degree that he never had it before, at least he says so. Bro. B. G. Wright then attempted to preach, but was only an attempt, Bro. Hickey had the Spirit. He was buried in the burying ground at Voree, in as good style as that part of the country could afford. I paid $20 for his coffin, and it was said to be worth $35; his shroud was of the finest silk flannel at a cost of $4.77. I considered him worthy of the best, and therefore I gave it to him.